Wednesday March 14th 1900 I got dinner early today and we took Luthers dinner up again Will took me up to spent the afternoon with Carrie. Did evening work and read till bed-time. Thursday March 15th 1900 I was busy a great part of the day with churning and baking and getting things ready to go to town tomorrow. Will and I caught some chickens in the evening Friday March 16th 1900 It snowed and blowed all day it was about as bad a day as we have had this winter. It was only fit to stay in the house and read. Luther was up in the timber and Will took his dinner up to him. Saturday March 17th 1900 Weather still cold and the roads very rough. Will went to town alone. I did the work and read a little and in the afternoon called over at Mrs Henlys. I read the papers all the evening. 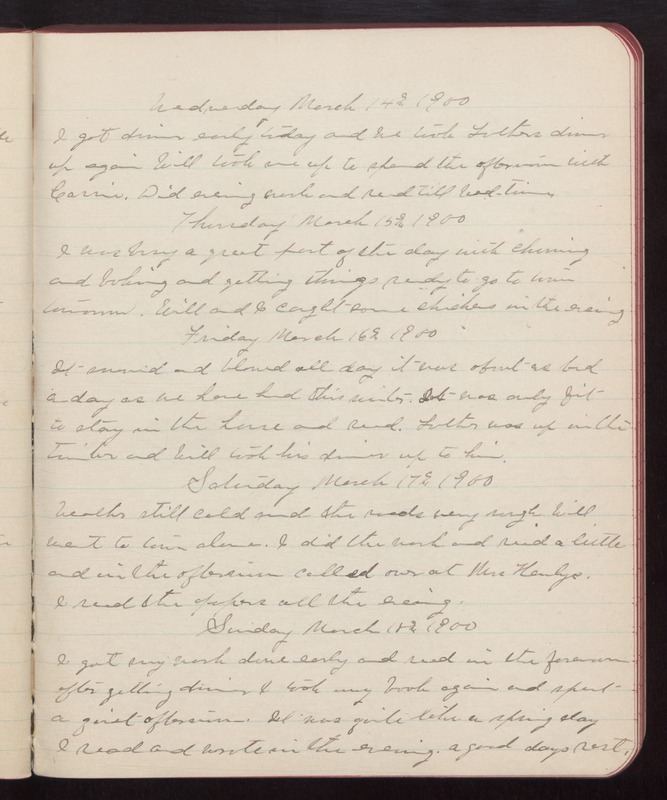 Sunday March 18th 1900 I got my work done early and read in the forenoon after getting dinner I took my book again and spent a quiet afternoon. It was quite like a spring day I read and wrote in the evening. a good days rest.